Troubleshooting network complications can be an extremely time-consuming and difficult process. Issues such as VLAN mismatch are tough to track down among the mountain of configurations needed to get a network operational. VLAN mismatches occur when two ends of a link are misconfigured to different VLANs. These can happen over access or trunk links. A mismatch on the link that carries the critical traffic required to keep the network functioning – the Native or management VLAN – causes additional headaches and potential security concerns. The above image represents a native VLAN configuration where management traffic flows untagged across the switch port links normally. The image below represents a VLAN mismatch. When the switch port on Switch 2 is misconfigured to VLAN 20, the management traffic will continue to flow between Switch 1 and 2, but any traffic returning to Switch 1 is treated as VLAN 20. This mismatched scenario could result in traffic being altogether dropped or potentially be a security concern if VLAN 20 has access to confidential data not normally accessible to VLAN 1 and the data makes it to the destination device. Meraki uses two methods to detect VLAN mismatches. The first method is to detect if the link is configured with the same VLAN type or number on each switch port of the link. The second method is to observe if the link is identically configured as an access or trunk (multiple VLANs) connection on both sides of a switch port. 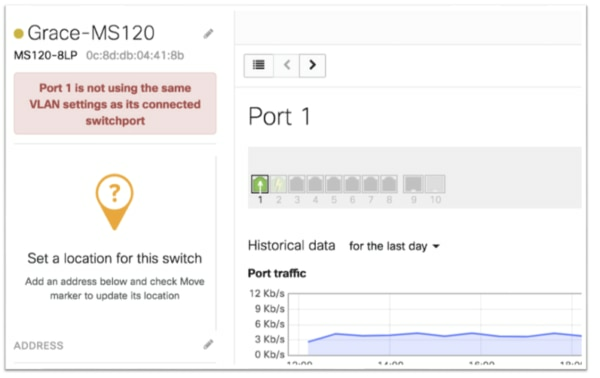 To help users spot the issue, Meraki has implemented VLAN mismatch detection that notifies users when an error is found. The dashboard now indicates when a VLAN mismatch has occurred on a specific port and what exactly is causing the mismatch. With the notification, users can now immediately diagnose potential issues in seconds and quickly isolate which port needs to be correctly configured. To find more information on how Meraki handles VLAN mismatches, head to our documentation page. To learn more about all of Meraki’s safety and security features for switches, consider attending one of our upcoming webinars.